Yesterday for my Wordless Wednesday I posted a picture of my daughter's broken Cinderella doll. The doll's head came off while my daughter and son were fighting over her. In church. Yes, you read that right. Because we were in church, no screaming, crying, or otherwise frantic actions accompanied the unfortunate incidence. Only very sad faces. Apparently this isn't the first doll to break, nor will it be the last. Today instead of reading or reviewing or answering emails or doing laundry, I spent some leisure time visiting the Internet Archive. If you've never visited the website, you are missing out. Fair warning -- looking at all the ebooks available on the website is a highly addictive pastime. Anyway, I came across this beautifully illustrated children's book called Child-land : picture-pages for the little ones : containing nearly 200 designs by Oscar Pletch, M. Richter. 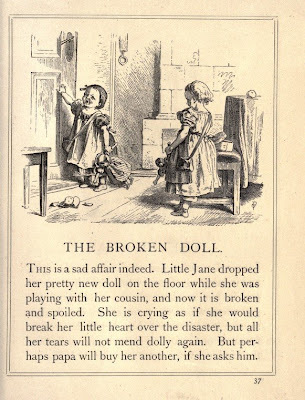 One of the picture-pages (love that term) contained a picture of and story about a broken doll. The ending, "But perhaps papa will buy her another, if she asks him" made me smile. Yes, Daddy could buy his daughter another Cinderella doll, but I think he will try super glue first. Visit Tell Me Thursday for more insightful stories behind Wordless Wednesday pictures. So sad. Poor little doll. :-( I'll check out that site, though. What a cool resource! Thanks for sharing it! Love the old picture. I have never even heard of internet archives. I am going to have to check it out! My Tell Me Thursday is here. Poor dolly. Thanks for sharing the links. Nice to see you at Tell me Thursday. Awww.. poor doll. I've never heard of that site though and can't wait to check it out! Thanks for playing TMT with us!